Ani's Book Abyss: WICKED!! 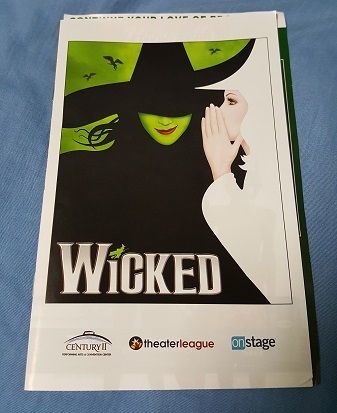 Wicked Fun! I know this production has been around for a long time, but I've never seen it before tonight. It was so awesome! I'm so glad I finally got to see it! 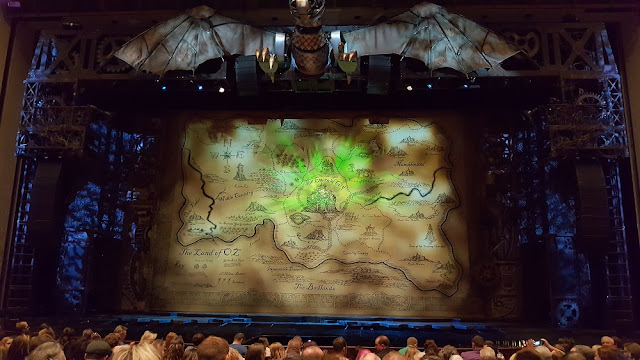 I realize I didn't get the entire dragon (top of stage) in my shot, and the map of Oz is a little fuzzy. But the setup was really cool, with a bit of a steampunk feel to it. I wish they'd had some sort of similar map of Oz in their little Wicked goodies booth; it would have made a nice souvenir. The show itself was both hilarious and thought-provoking. I've never actually read the book by Gregory Maguire, though my friend assures me that it's a bit different in tone. I might have to give it a go someday. The actors were all fabulous! I definitely enjoyed myself though, and that's all that matters!